As a property owner/manager in Florida, you have undoubtedly experienced the occasional, unwanted, abandoned vehicle left on YOUR property. Visitors park in wrong places, in fire lanes, block dumpsters, even double park in garages. These situations can be troublesome and even dangerous to you as well as your tenants. Jones Tow Truck Services would like to help you with these issues and perhaps any others your may have. Jones can provide ongoing parking lot management services for apartments, local shopping centers, local businesses – anyplace that people park that does need to be controlled. Often referred to as “non-consensual towing“, apartment managers and store owners often contact us for vehicles left improperly parked in their lots. Not only can these vehicles cause general issues for others, but they can be left in places that can cause REAL problems – in front of fire hydrants, blocking access points or worse. As a property owner/manager in Tampa, Florida, you have experienced the occasional, unwanted, abandoned vehicle left on YOUR own property. Visitors park in wrong places, in fire lanes, block dumpsters, even double park and garages. These situations become menacing to you as well as your tenants. Jones Auto Recovery Services would like to help you with these issues and perhaps any others your could have. 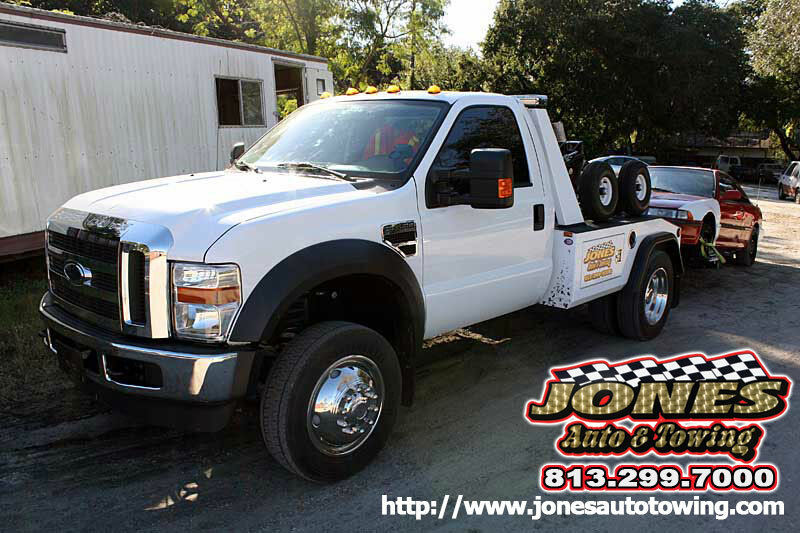 At Jones, we specialize in private property impounding and abandoned vehicle removal services. To learn more about these helpful services or to request them for your property, contact us today to speak with a member of our team. If a vehicle was left on your property for more than 24 hours without your consent; it is your right to have it removed under Florida law. No title is demanded. We will take away any licensed motor vehicle, including cars, trucks, motorcycles, snowmobiles, ATVs or trailers – anything licensed by DOL. We move abandoned vehicles at no cost. Tidy up your drive or parking lot and make room for your guests or tenants to park. We’ve been a licensed, insured, and registered tow truck operator for over 19 years. Our business is trusted, dependable, safe, and ready to help you. Please contact us during office hours to schedule a vehicle removal. We will provide you with service that fits your needs freeing up your time to handle more pressing issues. We provide impound services to Tampa, Brandon, Riverview FL, and the surrounding coverage area.